The mother hopes to arrive at Dáil Éireann on Tuesday. Vera meeting supporters along the way. DETERMINED MOTHER VERA Twomey is fighting illness and physical pain as she continues her walk from Cork to Dublin for her sick daughter Ava. The mother, along with her husband, supporters and TD Gino Kenny, arrived into Kilkenny this afternoon where they received a rapturous welcome. They had set off from Cashel in Tipperary this morning after Vera battled illness and pain from walking the huge distances. Vera has been suffering with tonsillitis and has strapping placed on both of her knees due to the hardship she in putting her body through. 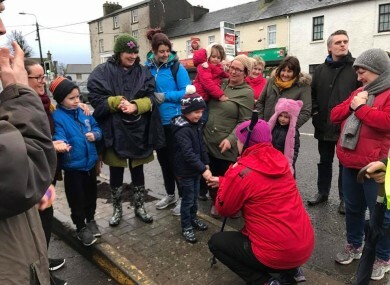 She began the 260km walk from her home to the Dáil as a protest against decisions to restrict her daughter Ava, who has rare form of epilepsy called Dravet’s syndrome, from accessing cannabis based medication. Speaking in a video posted on Facebook this afternoon, it emerged how Ava suffered another seizure yesterday morning. “Thank you very much to everyone in Cashel last night for the support. We’re heading out the road again today. Ava had a seizure this morning and we can’t stop. Please contact your TD and tell them as much as you can to stand up above in the Dáil and get the children the medicine they need,” Vera said. Vera and her supporters hope to arrive in Dublin by Tuesday. The mother has been in a number of meetings with Health Minister Simon Harris and has tried to get the Minister to allow Ava access cannabis-based medicine on compassionate grounds. Ava, who would have suffered dozens of seizures on a daily basis, has had access to CBD oil costing around €300 a month. CBD is a cannabidiol and is legal in Ireland because it does not contain any THC, the psychoactive part of the cannabis plant. Vera is campaigning for access to the full range of cannabis-based medicines. Last week, Twomey released a harrowing video of Ava suffering a seizure to TV3 and, , spoke to Ray D’Arcy on RTÉ radio following her meeting with Harris, where advocates Gino Kenny TD and Anne Rabbitte TD were also in attendance. Email “Vera Twomey battles tonsillitis and crippling pain to make it to Kilkenny ”. Feedback on “Vera Twomey battles tonsillitis and crippling pain to make it to Kilkenny ”.